The Podcast Weight Loss Challenge continues! Today, I am interviewing our next Podcaster Challenger…..Mike Dell. Mike Dell is the director of Customer Support at Blubrry Podcasting. Mike also hosts not one…but…FOUR…Podcasts! And Mike is also a Foster Daddy for Beagles! Mike supports the Mid West B.R.E.W. organization. Mike is looking to lose 40-50 lbs and finally…..
LIVE a long-term Healthy Lifestyle! We’ll check in on Mike’s progress throughout the year and see how he’s doing during the Challenge. Looking to LIVE a Long-Term Healthy Lifestyle? 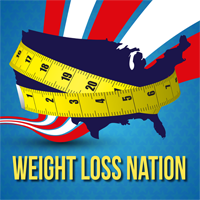 Check out Weight Loss Nation. Join me and let’s walk the journey together!